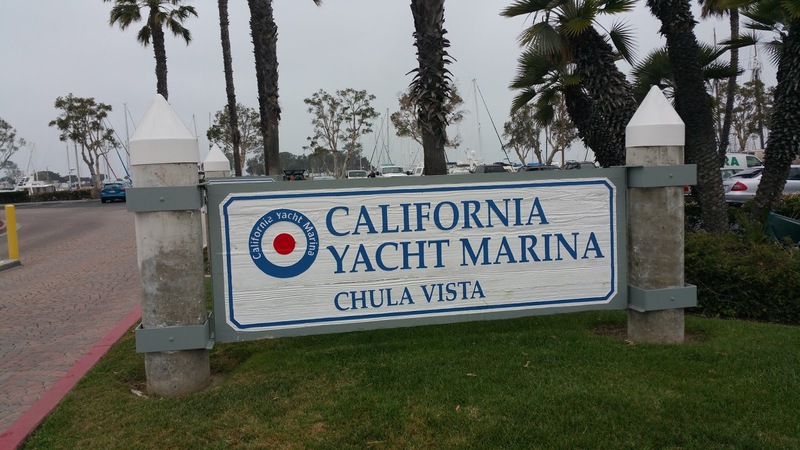 We spent the month of March at Chula Vista Resort and Marina. 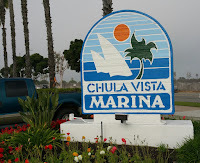 Chula Vista is halfway (7.5 miles) between downtown San Diego and the Mexican border. Chula Vista was, in the early days, a lemon growing community. That changed when, in 1941, a few months before the Japanese attack on Pearl Harbor, America's war machine brought Rohr Aircraft Corporation to town along with several thousand production workers. 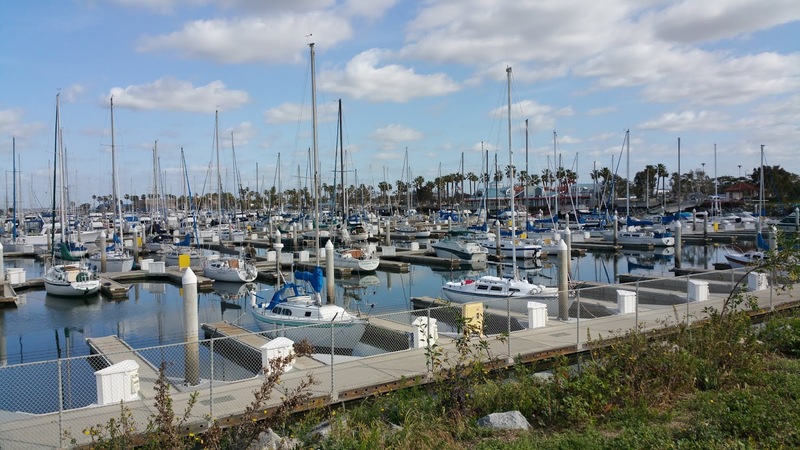 The housing demands and consumer support services needed for this effort insured Chula Vista would never return to it's simple citrus growing heyday. These days, the area around San Diego Bay, where we are, is pleasant enough and the east side of the county is also quite nice. The space between here and there however leaves a lot to be improved. 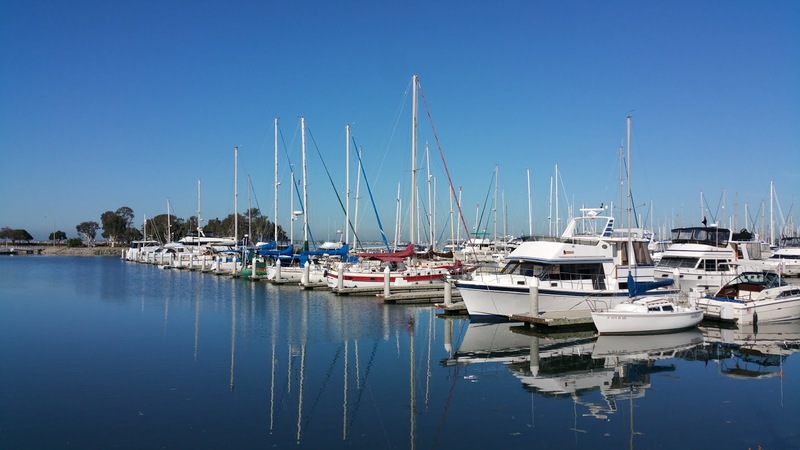 Again, I speak only for myself and I did enjoy my morning walks through the resort, along the marina and beyond. The calm water of the marina on a morning walk. More of my walking photos. As luck would have it, the day after our arrival, Ernie began to develop symptoms of a dreadful head cold. Desperate for a golf fix, he threw caution to the wind and the four of us played at the Chula Vista Municipal Course. 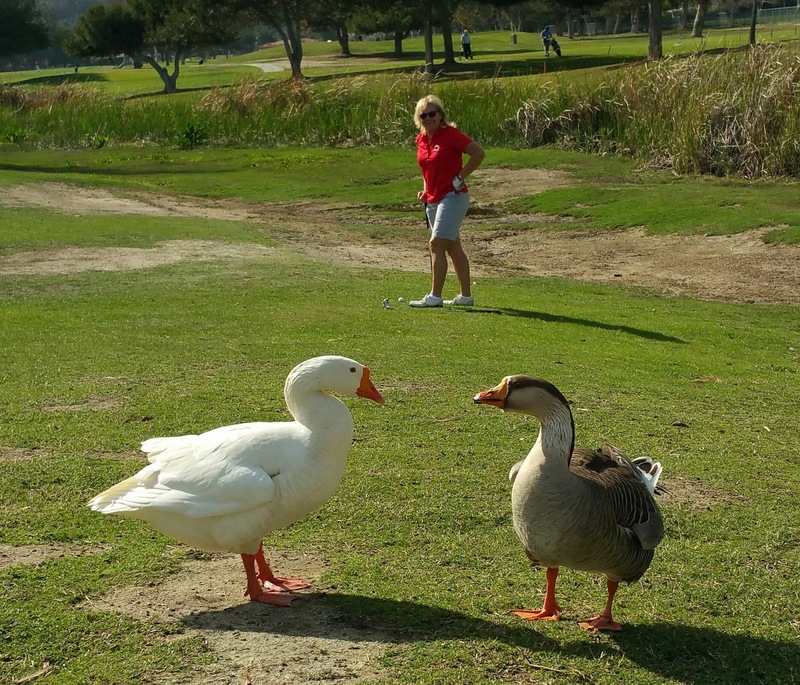 Chula Vista Golf Course's goose population made Pam a bit uneasy. A couple days later, Pam and Ernie sat it out while Wayne and I played another 9 holes at National City Golf Course. This municipal course was simply awful, with male golfers wearing muscle shirts using foul language. There were bicyclists, loud obscenities, group of walkers and strolling high school students all along the course. The cart path was abysmal as were the tees and fairways. Mark that one off the list. 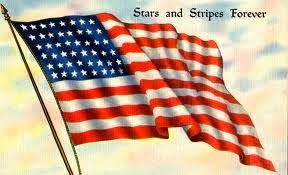 The following week Pam made a trip home to Maryland and I missed her terribly as did Ernie, I am sure. The three of us busied ourselves as best as we could considering our Social Director was absent. 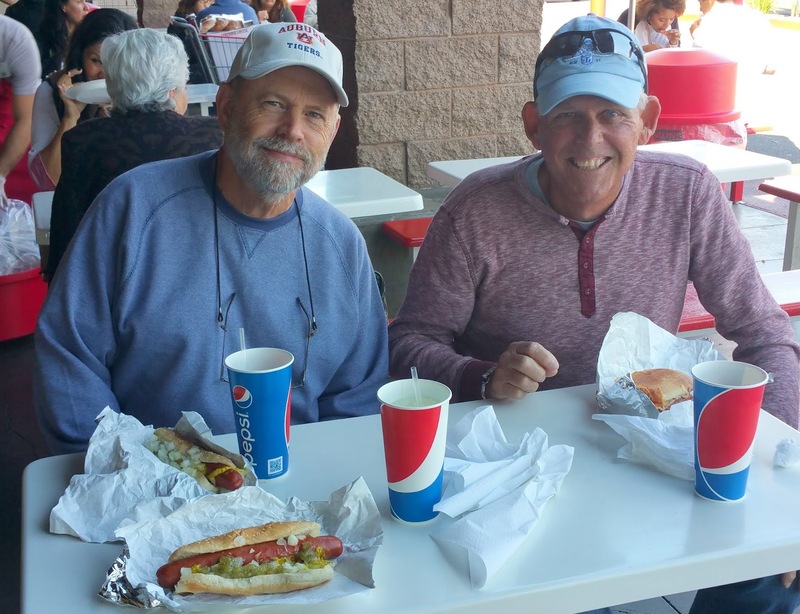 Without Pam to guide us, Wayne, Ernie and I resorted to eating $1.50 hot dog lunches at Costco. Here are the big spenders. As Ernie's head cold subsided, we found more golf to be played at East Lake Golf Course. It would be the best of the four area courses we played though all are what Wayne calls "valley courses" that appear to have been created in great drainage ditches. 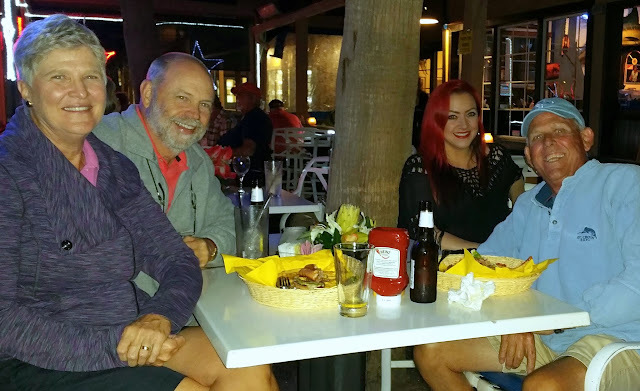 After our round of golf at East Lake, the three of us dined in style at the Galley Restaurant at the Chula Vista Marina, a waterside bar and restaurant within walking distance of the campground. 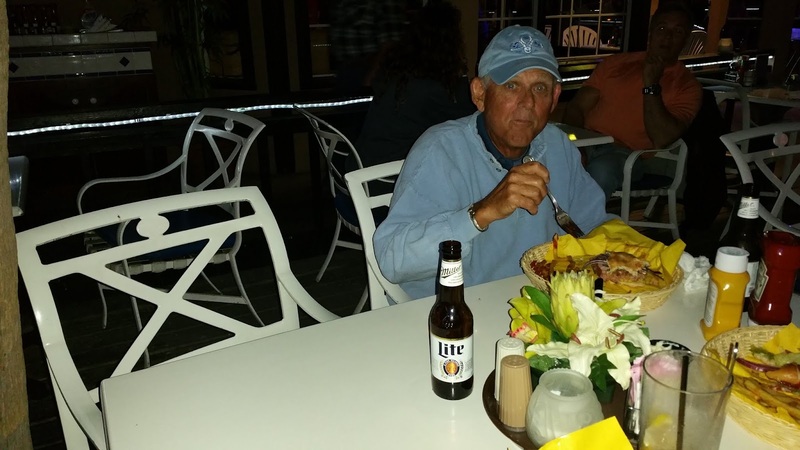 Pam's empty chair alongside Ernie who ordered a bottle of Miller Lite in here honor. It didn't take long for us to find a quick and willing replacement for Pam. Here she is: meet "New Pam" whose real name is Castle (yes, that's right), a hostess at The Galley. 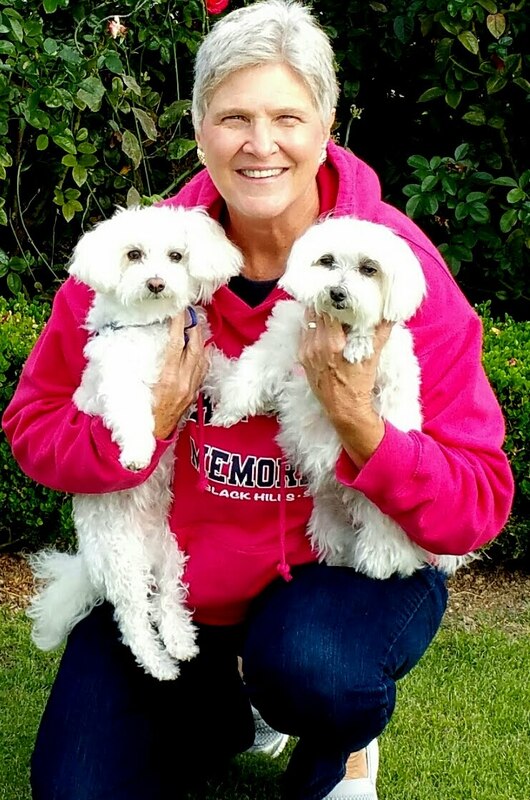 Of course we sent these pictures to "Old Pam" to encourage her to hurry back. 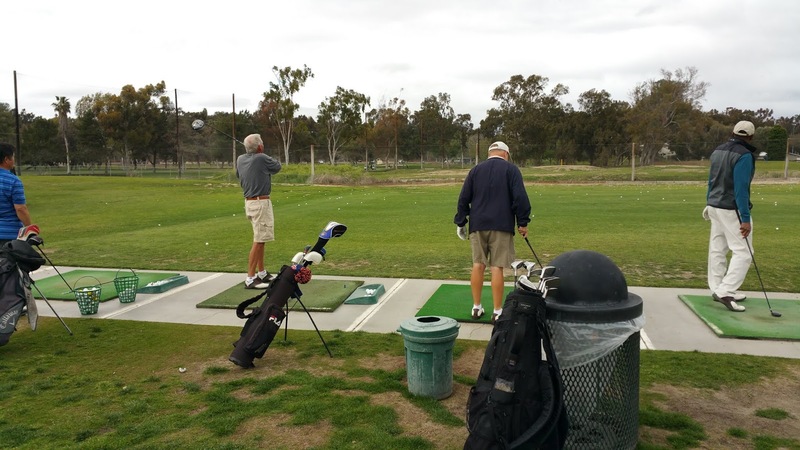 We hit practice balls at Chula Vista as I am trying to correct my "worm burning" strokes. After meeting some of our neighbors, we arranged another foursome and played Chula Vista again. 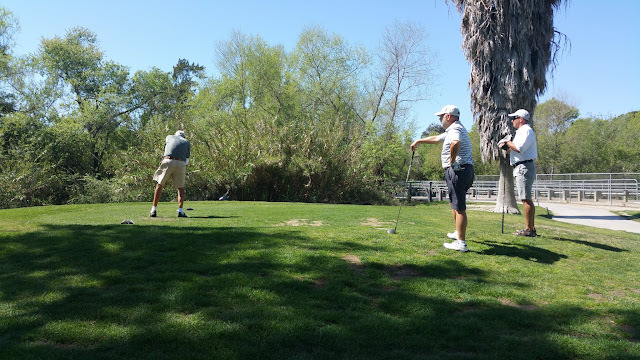 In this picture, Ernie is the ball striker, while Wayne and our new friend, Jim Chele, look on. Pam did return after just ten days... seemed longer though... and we quickly fell back into our structured routine -- or lack thereof. 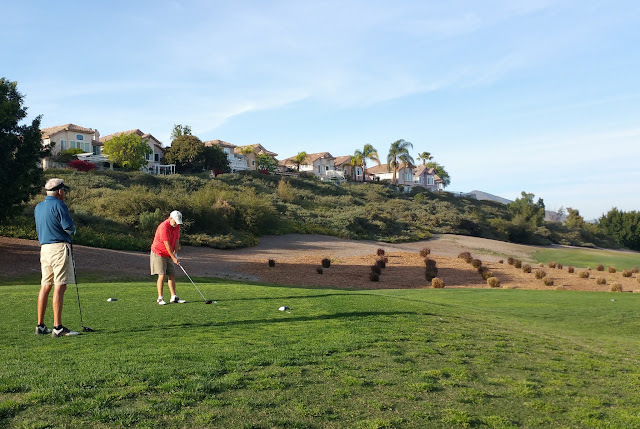 We tried yet another municipal course, this one was Tecolote Canyon, an appalling 13 miles north of Chula Vista, but easy enough to reach -- as long as the traffic flowed well. Another narrow valley course, Tecolote Canyon had an added dimension: DANGER SIGNS! 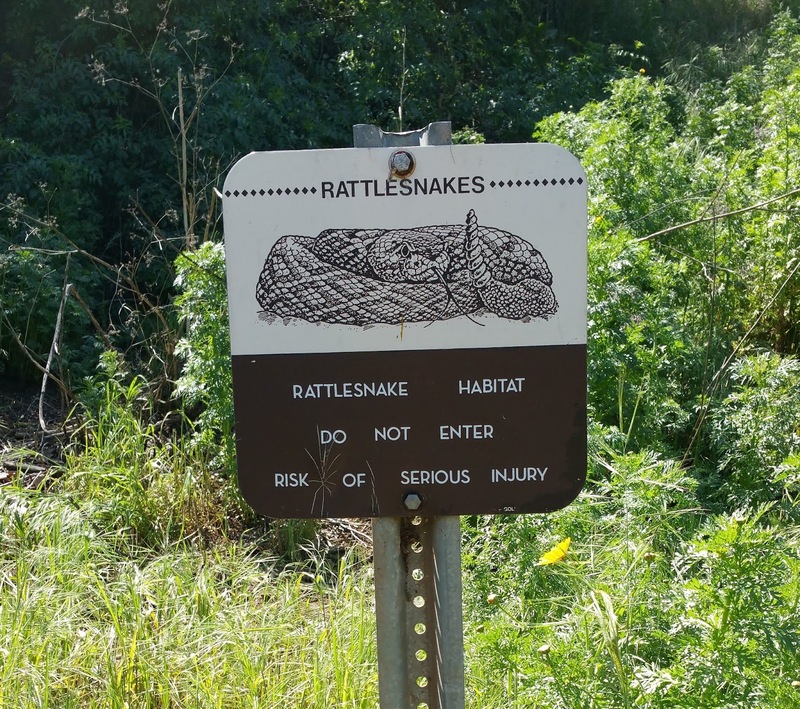 with rattlesnake warnings. This makes a real difference in deciding whether or not to go chasing lost golf balls.